Stop me if you’ve heard this one before: humans make machines, machines have pretty big flaw that no one notices until it’s too late, machines cause apocalypse, humans now live in a post-apocalyptic world fighting against machines. I know, I’ve just described The Matrix, Terminator, and countless other stories. The hubris of humankind when creating machines is a theme that’s so well-tread that we all fear Siri will one day rule the Earth…after she tells us “drool the mirth” isn’t in our contacts. While the robot apocalypse theme isn’t a new one, it’s still possible to take that theme in a new direction to make a unique story. Horizon: Zero Dawn has a lot of familiar elements in both story and gameplay. The robot apocalypse plot, the combat, the leveling and skill system, the open world, collectibles, and so on. Even with all of those familiar elements, H:ZD feels like its own thing. It takes inspiration from themes and mechanics which have been used before and gives its own take on them to make them its own. I’ve played games like this before, but that didn’t stop it from being an entirely new experience. 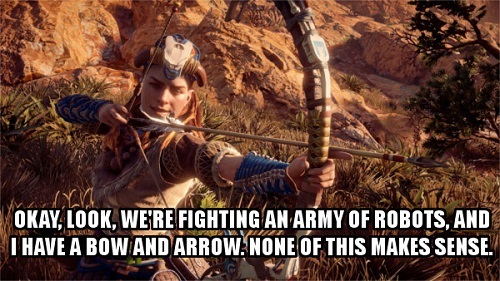 The story follows Aloy (played by Ashly Burch), an outcast from the Nora tribe raised by fellow outcast, Rost. Aloy has been an outcast from birth owing to the strict tenets of the Nora society and its religion. Her biggest sin is not knowing who her mother is – in fact, no one in the matriarchal tribe knows who her mother is. She starts out on a quest to discover her mother’s identity, tracking a cult killing people, and finding her place in the larger world outside of Nora territory. It’s a good setup for a player character because she knows as little about the world as we do. She’s learning about the outside world, its people, it creatures, and its hazards at the same time as the player. Aloy is one of my favorite protagonists in a while. She’s determined, compassionate, sarcastic, and – despite her sheltered life – she’s not at all naïve. Rost may have raised her to respect the teachings and religion of the Nora, but she has enough of a curious mind to still look for the truth behind what she sees and hears. This may be in part because she found a Focus in her childhood. A Focus is a small device warn on the ear which acts as a scanner, personal database, and communications tool, as well as a means to interact with other technology. 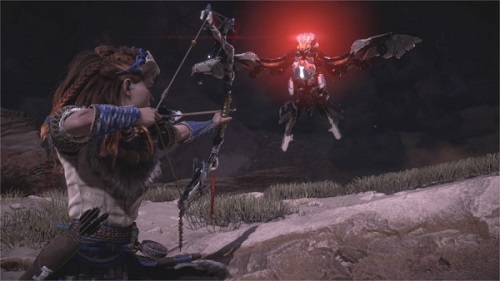 At one point, Aloy interacts with a machine which some people view as a goddess, but when she tells the people what she’s learned she still uses their terminology. You get the sense that not only is it “this would take too long to explain” but also that she respects the beliefs of the tribe enough that she doesn’t want to completely upend their culture by showing them the man behind the curtain. In her quest, Aloy will meet a lot of people – some enemies, some allies. They all have their own unique personalities and histories. These aren’t just quest boards; they seem like living people whom Aloy can run into in the middle of their day-to-day lives. As you do quests and sidequests, the legend of the Nora machine hunter begins to grow. By the end of the game, you may find that some of the people you helped along the way are taking part in the final battle. I wandered into a village in the early hours of my playthrough and picked up a pretty simple sidequest that I didn’t think would have any lasting effect, but at the end of the game one of the villagers was there before the final battle, thanking Aloy for her help. You interact with people in the world through a pretty simple dialogue system. If you’ve played any of the Mass Effect or Dragon Age games, you know what you’re in for. There aren’t really branching dialogue paths so much as a handful of questions and responses to burn through. They’re there to break up the monotony of what would otherwise be a cutscene and add that tiny bit of interactivity. It’s also there to provide additional exposition. You could ask random person about the history of the Sun King before you do their quest, or you could just go in and get the job done. I love a good story, so of course I’m going to exhaust every dialogue option, but you don’t have to – that’s why the system is there. There are maybe about a dozen options where you have to resolve situations with one of three options – taking a brains, brawn, or heart path – but they don’t seem to have a huge impact on the story. Aloy’s choices are brought up in later dialogue, but apart from that there are no world-changing decisions. The gameplay, again, feels familiar. It’s an open world with several points of interest like main quests, sidequests, collectibles, herds of robot animals to fight, and sights to see. There are ruins of the civilization that came before as well as pillars of the current society. Optional objectives can be found in villages and cities throughout the world, but there are also things like figurines and metal flowers to collect. Some of the more interesting collectibles are Vantage Points, which allow you to see the world as it was over a thousand years ago at the height of the old world. 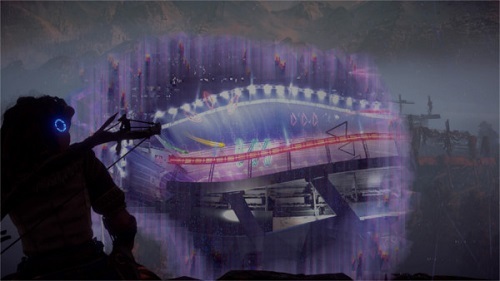 There are even a few recognizable landmarks which give clues to the game’s setting. Combat is a mixture of melee and ranged attacks. You’re equipped with a spear as well as a bow with a variety of arrow types. Enemies sometimes have elemental weaknesses in addition to their weak points, and even the weak points have elemental weaknesses. The Focus lets you scan for all of these weaknesses and mark enemies so you can keep track of them. Early game combat can be frustrating against tougher enemies until you can get the hang of what the game expects you to do. There’s a lot of dodging and knocking components off of enemy machines to expose weak points. When it clicks, the combat becomes really satisfying, especially when you’re taking down a machine the size of a T. Rex. You can mix up combat with things like the Ropecaster, which pins enemies to the ground with strong cables, or the Tripcaster, which lets you lay tripline traps of different types. There’s even a stealth element where you’re crouching in tall grass to take out enemies one at a time with distractions and stealth kills. My favorite mechanic is taking over enemy machines. Early in the story, Aloy will come across a way to reprogram machines and make them friendly. You can use this to turn robot horses, rams, and bulls into mounts to traverse the world more quickly. In combat, it becomes a way to gain an ally. You have to be undetected to use it, but if you take control of an enemy machine, it can fight for you or provide a good distraction while you sneak by. One of the most awesome moments in my playthrough was taking control of a large robot mountain lion near a group of human enemies. Its pathing wasn’t enough to bring it in range of the humans, but when I crouched in tall grass close enough to the machine, I shot a single arrow at one of the humans and alerted them. The wounded human and his friends spotted me and ran to attack, only to find themselves up against not only Aloy but a very big and very angry robot kitty. The machine took care of the enemies who were moving to attack me, going from one to the next until it started tearing up the bulk of their forces still in the encampment. By the time I finally got there, all of the human enemies were dead and my robot friend was on his last bit of health, so I finished it off and took the loot from both the machine and the humans. All with a single arrow. There are two elements to H:ZD which will stick with me for a long time – the visuals and the story. The game takes place in Colorado and Utah a thousand years after the apocalypse. So there are snowy mountains, lush green forests, and arid deserts. It’s really gorgeous. The screenshots barely do it justice because this world looks even better in motion. I’ve got dozens of screenshots from this game and it was so difficult to narrow it down to a few to use for this review. 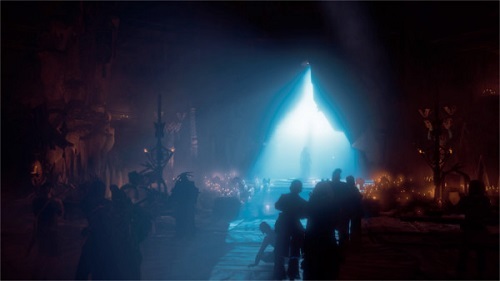 It’s not just the lighting and the environment; the world-building is fantastic. Humanity has been reduced to a simpler time of relying on bows and spears, but they’re still interacting with and using some machines of old. There are obvious influences taken from pre-technology indigenous cultures, but with a spin on them to make them unique to the H:ZD world. The characters in the game wear animal skins stitched together with wiring from machines. Armor incorporates plates from robot animals where animal bone would have been used. The game also adds subtle and not-so-subtle differences in clothing and aesthetics of different regions and people. Once you’ve met enough of the different people of the world, it’s easy to tell from clothing styles who’s Banuk, Nora, Carja, etc. The machines are also well-designed. They range from the smaller, easy-to-dispatch Watchers to the enormous and deadly Thunderjaws. Each also seem to serve a weird purpose within the world. The ones patterned after herbivores can be found grazing in herds, and the larger and more carnivorous-looking ones patrol and defend their territory. 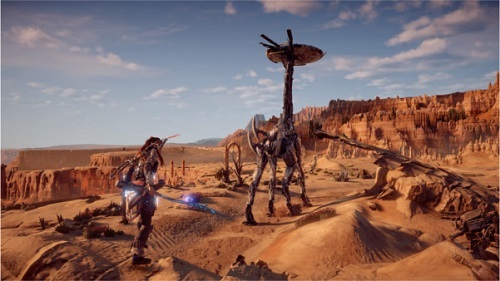 Massive giraffe-like Tallnecks can be used to clear the “fog of war” from the map while also marking machine sites, since they seem to have that information stored in them. You get a sense that each machine was designed to mimic or maybe even replace specific animals in the ecosystem. It’s not all natural environments though. In order to upgrade your spear to be able to override larger machines, you’ll need to venture into Cauldrons – large machine-made structures which serve as factories for the robots of the world. The cold metal tunnels are bizarre and alien compared to the natural environments outside, but are beautiful in their own way. You’ll also explore places built before the apocalypse where audio logs and text entries will clue you in on what happened during the fall of humanity. One of the less spoilery highlights is a room filled with data terminals containing messages between a husband and wife. The husband is fighting a hopeless war against the machines and, because of the need to keep morale up during a hopeless war, the messages between the two are heavily redacted. On one side of the room are the sanitized messages from the husband which sound like war propaganda. On the other side are the unedited messages from the wife, who becomes more and more concerned that her husband doesn’t sound like himself and suspects that the messages she’s getting may be pieced together from earlier messages. It’s haunting, heartbreaking, and the more you learn the more frightening the world’s end sounds. I’m not going to spoil the story of the apocalypse even though it’s just one small part of the game. I will say that finding out how the world ended and how humanity survived had an impact on me. Again, this is ground that’s been tread before, but I don’t think I’ve seen it told quite in this way. The scenario for the few surviving humans sounds frightening and hopeless, and the way it played out for some of them is horrifying. Despite that, there’s a message of hope and endurance in there. Even Aloy’s story is one of constantly moving forward. When her quest seems to be at a dead end, she doesn’t take time to despair. She looks for another way to move forward. It’s a message I think a lot of us can appreciate. Horizon: Zero Dawn is easily on my games of the year list and the year has barely started. I took a long time to write this review because I wanted to explore as much of the game as I could. It’s a shame it’s only available on PlayStation 4, because this is a game I want as many people as possible to experience. I don’t know if I’d call it a system-seller since a PS4 is a pretty big investment for just one game, but if you have a PS4 or can borrow a friend’s, the game is absolutely worth playing. This entry was posted in Reviews and tagged author: kate spencer, horizon: zero dawn, video games by queenanthai. Bookmark the permalink.